I fell down the deep, dark rabbit hole of chronic Lyme disease sometime during the summer of 2014. My headlong descent was not by choice. 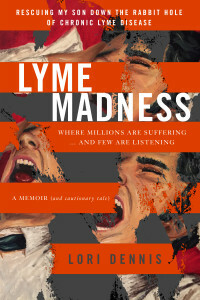 LYME MADNESS IS NOW AVAILABLE ON AMAZON.COM. PROTECT YOU AND YOUR LOVED ONES from being affected by an illness that is disabling, debilitating and potentially deadly. GIVE YOU INSIGHT and HELP YOU NAVIGATE this complex, multi-systemic illness - one that has reached PANDEMIC proportions and one that is being widely ignored and negated by the global medical community. SAVE YOU TIME and ENERGY as you wade through all the research, misinformation and complexities of this illness. Enter your email address and receive updates on Lyme Madness courses, webinars, podcasts and more. Copyright 2016 - LymeMadness.ca - All Rights Reserved This website is for informational purposes only and is not a substitute for medical advice, diagnosis, or treatment.